Every family has it’s own set of quirky holiday traditions but for new parent’s just starting their families, sometimes the part that’s the most fun is starting the traditions. Here is the list of our top five suggestions for Christmas traditions to start for your children. #5 Convince your children of the Christmas elves. This one is relatively simple and can be a lot of fun for both you and the kids. Go to the local craft store and purchase a couple of very small stockings (one for each of your kids) that can easily be hung as oversized decorations. Five or six days before Christmas make up a story about a Christmas elf who spreads Christmas cheer by bringing little presents to children and tell them to check their stockings every morning. After they go to bed each night place a small item in their miniature stocking for them to find. 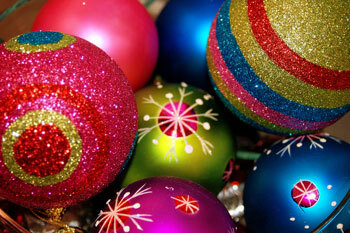 These items can be candy, toys or trinkets just so long as they are small enough to fit in their stocking. Do this for the next few days except for Christmas eve. When the kids wake up on Christmas morning their tiny stockings should be gone and replaced by Santa’s stockings. Everyone knows that Santa lands on the roof so that he can go down the chimney but what about the houses that don’t have chimneys? There’s no point to landing up there if you have to come through the front door. If this is the case for your home make sure the reindeer know where to land by creating them a sparkling runway on your lawn. In a Ziploc bag or container mix a few cups of dry oats and a whole container of glitter and shake till it is thoroughly mixed. Give this concoction to your children and tell them to put it in the front yard where they want the reindeer to land. This is especially pretty in areas with snow. #3 Cookies? Who needs them? Traditionally most families put out cookies and milk for Santa to snack on before he leaves but what happens when Santa gets tired of cookies. Take turns every year letting one of your children pick out a new treat for Santa when he comes. 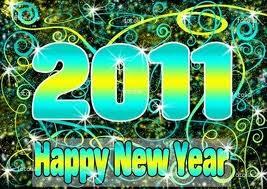 It could be some left overs from the fridge or even a baked treat that you and the kids make together. The key is to get them involved and get them excited. #2 Have a Christmas movie marathon! Everyone has a favorite Christmas movie or special that they enjoy watching. Put all of these titles in a hat and watch a new one each day. This allows all of your children to have some input and it’s a special time for the whole family to settle in to spend some time together. 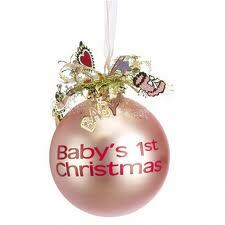 Most babies have a “Baby’s First Christmas” ornament that is given to them on their first Christmas. It’s something special for the parents so that every year when they decorate the tree they remember that special time. This same principle can be applied to children as they grow. If every year you give them a new ornament or let them pick one new one out, as they get older they will have special memories that they will remember for years to come. For small children sometimes making a new ornament can be a special treat as well. Christmas is really a time for togetherness and being thankful for your family, make the most of this time by creating warm memories and traditions that will grow as your family does. Your children will remember it all one day and probably pass these traditions down to their children. Regifting is one of those Christmas faux pas that everyone does and no one talks about. It is a practice that is widely frowned upon but oddly that doesn’t stop people from doing it. 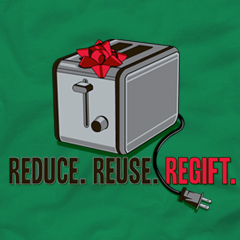 Regifting however doesn’t have to be that slap in the face insult that everyone thinks it is. There are a few ways to pull off the infamous regift without insulting your friends and looking like a cheapskate. Rule #1 – If you REgift, REwrap! Everyone gets presents that they do not want and sometimes when we get desperate for a last minute gift for someone you forgot then regifting may be your only option in a pinch. 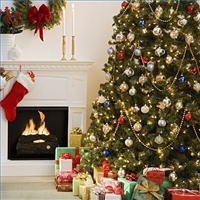 Many people will store their unused presents in their original packaging (gift bag, box, etc.) If this is the case make sure you update the packaging so your secret is not discovered. Three telltale signs of recycled gifts are dust, dents and outdated packaging. If your going to regift it, wipe the box down and rewrap it with new paper and ribbons or, at the very least put it in a new gift bag with a new tag! Rule #2 If you have used it, don’t regift it. There are a few cheapskates who give all regifters a bad name and they usually do this by giving gifts that they have already used. There is nothing wrong with giving your sister in law a few cd’s that you don’t want anymore but not if you are trying to disguise it as a new gift. 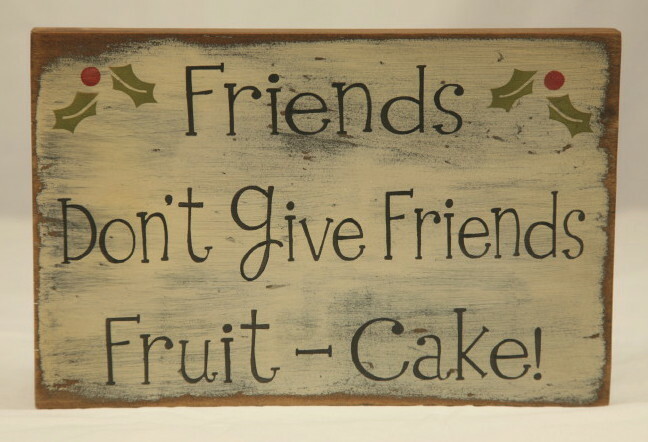 This is especially true for things that you have had around your house. You may not want those beautiful sconces any more but if your giftee recognizes that they were once in your living room you may be in trouble! Rule #3 -Keep a list. If you get some less than desirable presents that may be eligible for regifting, make sure you remember who gave them to you so you avoid the catastrophe of regifting the item back to them. This can easily be accomplished by simply writing down what you got and who gave it to you so you can consult it later on when making a last minute regift decision. Rule #4 – Avoid regifting from the bad gifts list. There are certain items that are horrible enough when you get them, keep yourself out of hot water by stoppin g the cycle and not passing these items along. Her is a brief list of items to avoid. Rule #5 – Donate or SELL what you can’t regift. Sometimes you just can’t regift something because no one you know would want that item. If this is the case just rid yourself of the item all together. The easiest way to do this is to donate it. Simply give it away or give it to an organization looking for unused presents. 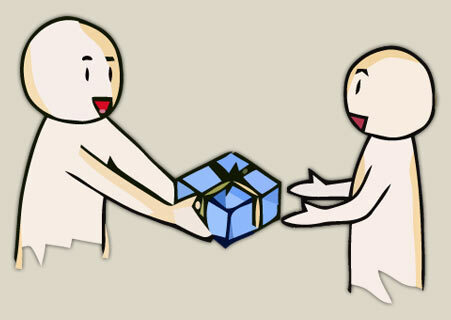 The other way to rid yourself of ungiftable items is to sell it. EBAY is a great forum for people looking to sell they’re unused items and there is absolutely no angry holiday backlash. It’s definitely worth a try. While regifting can be tacky, it doesn’t have to be. Just remember to do it tastefully and keep your mouth shut. If no one knows but you then you’ve achieved your mission. This “movie” came out as a TV special back in 1987 — long before most of your kids were born but it is still an excellent selection for your movie marathon. 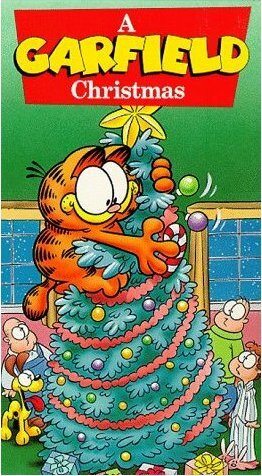 The plot revolves around Garfield, Jon and Odie traveling to Grandma’s house for the Holidays and all of the mischief they find along the way. It’s universal themes of giving and love along with Garfield’s crazy antics put it on our list of faves. This movie is a classic and most everyone has seen it a dozen times. The film is about an angel who helps a man to see how things would be if he never existed. The black and white cinema masterpiece is a touching part of most everyone’s family tradition and is worth the watch for you and your kids. Some may be surprised that it didn’t rank higher on the list but because of it’s content and themes it’s not necessarily as captivating for kids as other movies. The plot of this movie is one that you’re whole family will love. 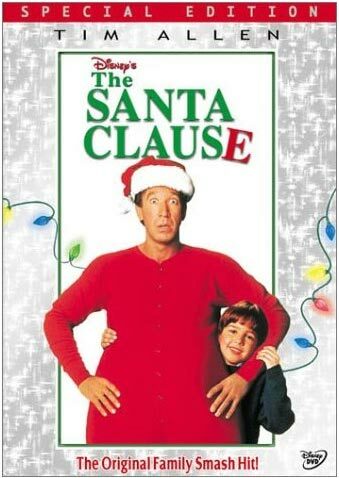 After Santa dies falling off his roof, Tim Allen (who plays the lead character) becomes Santa Claus. This movie is all about believing and your children will have tons of fun witnessing all of the Christmas magic. There are also two other films in this series, none quite as good as the first but all are wonderful choices. Originally released back in 1969, Frosty the Snowman is a timeless classic that both children and their parents have been enjoying for generations. The plot revolves around a snowman that comes to life and brings joy to the towns children until he melts away. You will laugh, cry, ooh and ahh for 30 minutes and it will definitely put you in the Christmas spirit. Like Frosty, this classic was also released back in the 1960’s and has it’s own famous theme song! 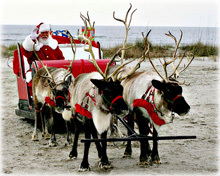 Rudolph the Rednosed Reindeer has been one of the most well known and popular Christmas movies all time, and for good reason. Even though the animation is outdated and your original copy is probably on VHS, this family film tops our list because it will bring you a heart full of good memories and a smile on your face. The movie’s plot which revolves around a little outcast reindeer has themes that many school age children can relate to and will keep you and your children captivated until the heart warming end. So hurry up and go scan your TV guide to see where you can find these films for your Christmas viewing pleasure. You will be passing down a love for these classic films to your children who will probably continue to enjoy them for years to come! In celebration of the holiday season the Crazed Content blog will be featuring an array of Christmas and Holiday content until January along with our regular news and pop culture content. I would also like my readers to know that I will be featuring several guest bloggers on various holiday topics through out this time. If you are interested in possibly guest writing please contact me via e-mail or website for more information. So as always feel free to browse, read, subscribe and comment. I love hearing from my readers and I value your input. Lawyers to the Michael Jackson estate recently stirred up controversy when they started a very public battle to keep Michael’s mother, Katherine Jackson and her business partner, Howard Mann from using Michael’s image to make money. Katherine and Mann have worked together on several recent “projects” including a book “Never Can Say Goodbye” and the Jackson’s Secret Vault website that is basically selling Michael books, CD’s and DVDs. Lawyers of Michael Jackson’s estate are furious and have sent a cease and desist letter to Mann in hopes of preventing future exploitative attempts from his mother to make money off her dead son’s name. Coincidentally it appears that Katherine Jackson is already receiving more than $26,000 a month from Michael”s estate and has been recently reported to have been unsatisfied with this amount and is now complaining that she wants more money. It is also a known fact that Katherine also signed a contact with Vintage Pop Media which is a large scale company that owns a great deal of Michael memorabilia. The contract stated that Katherine Jackson would pen the a fore mentioned book “Can Never Say Goodbye” and that she would also participate in the making of a documentary produced by the company. This company is giving her a MINIMUM of $10,000 dollars a month in revenue with no listed stop date. It never fails to surprise us when we hear that someone is attempting to exploit Michael Jackson’s name and image to create profit. It is however oddly strange that the person doing it would be his mother. Michael Jackson was a legend and hasn’t been gone for even a few years yet and instead of grieving and moving on with her life and family, Katherine Jackson is interfering with the future welfare of Michael’s three children by milking as much money from her deceased son’s estate as humanly possible, money that in all actuality she has no business having. I understand the woman is his mother but with several other successful children and business ventures you would think that she would have other sources of revenue besides Michael’s estate. It just seems as though Katherine Jackson is a heartless money hungry woman who cares less about her own grandchildren than she does about getting a free ride. She is essentially trying to live the life of luxury by living off the revenue made by her dead son’s name. It’s sad to say but it seems as though things will not change in the near future. Michael’s estate lawyers are desperately trying to clear up the debt surrounding the estate in hopes of providing his children an outlet for financial security in the future. It is my sincerest hope that Katherine Jackson will take the opportunity to evaluate her life and consider focusing on her lack of skills as a parent and grandparent and less on becoming rich by exploiting Michael’s legacy and name. -Click HERE for a copy of the Cease and Desist letter from MJ’s attorneys. Miley Cyrus– Trippin’ on Salvia? Video surfaced today of newly legal, 18-year-old Miley Cyrus taking a hit from a water bong at a recent party. The video was supposedly shot on a friends camera at a party five days after her birthday. The clip was supposedly stolen and leaked from the friends camera without her knowledge (yeah, OK.) and now the entire internet is buzzing about Miley’s apparent drug problem. Normally, I wouldn’t comment on things like this because I feel that in most cases it only adds to the slander and untrue gossip can only make a situation worse HOWEVER…. I don’t feel like there are many journalistic sources taking an objective view of the situation so I feel like I need to say something. While it wasn’t the greatest choice of activities to celebrate her new coming of age, technically Miley, really wasn’t doing anything wrong. I watched the video myself (the link is posted down below for my readers) and saw her describe her “trip” to her friend who was filming her. She appeared to be a healthy happy and vibrant girl laughing it up with her friends. I don’t by any means support doing social drugs but the point stands that while Salvia is on the governments watch list (along with K2 and similar incense) it is easily purchased at any local head shop and in most states is legal. I understand that Miley’s new “Adult” style music, appearance and choice of activities are not exactly what you call role model material but neither are the life choices of most celebrities. I find it odd that video of celebrities like Paris Hilton and Lindsay Lohan, belligerent in a bar will not get nearly as many views or criticisms as poor Miley taking a hit of Salvia when both are equally as legal to engage in. Like I said, this is just this blogger’s opinion. I have two young teen sisters and while I wouldn’t encourage them to follow in Miley’s footsteps I don’t necessarily believe we should be doing much judging. It’s her life. Let her live with the consequences. In case you wanted to see the video yourself, here is a direct link to the video featured on the TMZ website.